Saturday I received a call from an art collector and sold a painting he had seen on this blog. Although I consistently sell paintings via my traditional gallery this was the first painting I've sold via the internet. Many assume I have a thriving online art business since this blog has had over one million visits. I have received benefits that transcend finances but I remain astonished at how difficult it is to turn online presence into monetary success. At my recent opening Alpine Art gallery director Susan Bohmholdt told me that several of her abstract artists are posting via Instagram and selling their work. She showed me how to set up an account, emailed me a montage of my work composed on her phone, and within minutes I had an Instagram image–with hashtags–that represented my work in a positive and extremely sharable way. Later I downloaded some montage apps for my phone and began creating Instagram images. I have to admit I found this visual approach very appealing and harmonious with how most artists think. 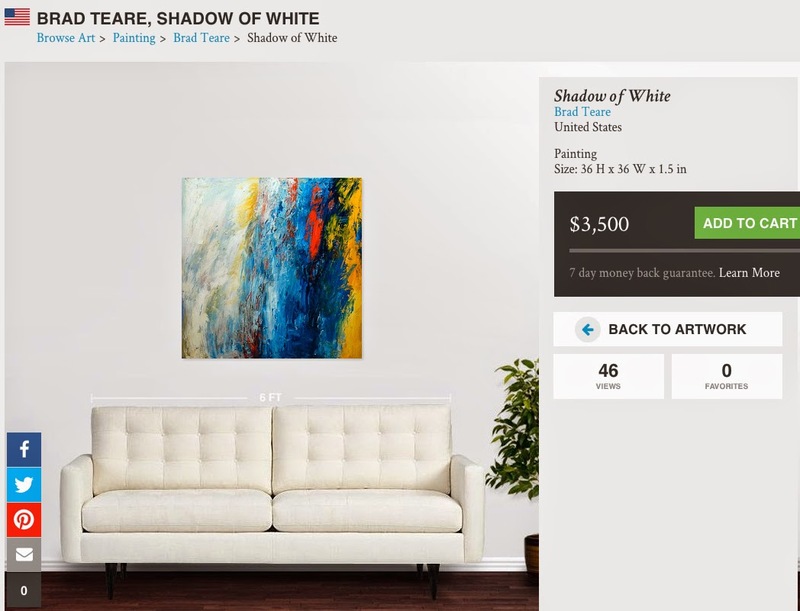 Coincidentally I had been considering creating an account with Saatchi Art–one of the more prestigious art sellers online (read more about them here). I created an account, posted four images, and began my online sales efforts. Time will tell if this is an effective strategy. Intuition tells me there are many missing ingredients to this business model that are yet to be discovered. If you like what you see at my Saatchi site please click the heart button. There are many positive aspects to the Saatchi site. But in many ways it still seems like an awkward way for collectors and artists to connect. Let me know what you think of the site. UPDATE: I saw this ad in an unrelated page. I'm not sure if it was targeted or if Saatchi is actually randomly advertising images from its site. The latter scenario would mean Saatchi is truly interested in leveling the playing field for artists. The image below is a screen capture and is not clickable like the original banner. I'm glad you continue to try new venues for sales, including instagram. I'm also glad you share your thoughts on what you are trying to do in order to increase your sales. So many artists are so selfish in that way. I think they are afraid that if they help others understand what they are doing to specifically drive sales might detract from their sales somehow. I don't get it. I have been doing some paintings that I thought would appeal to others, rather than what would appeal to me. They've definitely found appeal. Colorful pictures of songbirds, kids at the beach, flowers. Simple. Accessible. But in the end, they really didn't result in any sales. I will be going back to my regular motifs. NOt that I think that what I've done is a bad idea. It has gotten some good likes and appreciation from folks. but I think I'd rather make paintings that I enjoy, while painting the occassional gift painting for someone else. These birds and flowers and such are just to syrupy for my own personal tastes and I need a good landscape to clean out the excess sugar sweetness! I hope I'm wrong, but I think the art market is over-saturated. But I do know it's still possible to sell and make money. You just have to try to fight for it as you are doing, trying different venues, mixing things up, and be persistent. I wish you the best of success, and I"m proud to read along here as you share your story. I think fine artists tend to hold their cards a little closer to the vest. Illustrators are pretty open about how their personal business is going. I think right now especially fine artists find the market so competitive that there is little room for cooperation. I think you are quite right about the market being over saturated. Take a look at Plein Air magazine. The quality of the work is mind boggling. Even ten years ago people weren't painting at that level. It's really amazing. I'm thinking the plein air craze has about played out. The work is amazing but it is getting to look all the same. Which isn't good. Overall I don't think it has helped the art market much. I had hoped that it would cultivate a new aspect of the art market but I don' that it has. Completely agree. It's not my idea: A conversation with artist Mikel Wintermantel really helped open my eyes to how homogenous plein air is and how ubiquitous it is. There's lots and lots of artists painting en plein air in the same fashion. He said he was getting some PR because his works were different than everyone else's. Stand out from the crowd as it were. Some artists, like Joseph Paquet, I just don't understand how they get so much $ for their works. I mean, he's a fine painter, but not THAT fine. It just doesn't make sense. I think it's like the stock market: It's very fickle and prone to fads. "You gotta buy ebay...I mean apple...I mean Uber." Uber has like $40 billion in market value and like 1000 employees and no assets. yet they just killed it with their stock offering. It makes no sense. But in the end, I think I'm coming full circle back to the notion of painting to grow, learn, and paining for self. If you happen to be (lucky) (Skilled business person?) able to earn a living at this, well...you are accomplishing a very mean feat in today's economic environment. I think the plein air movement, along with "Daily Painters" have fortunately created lots of new artists doing some pretty decent works while at the same time creating lots of swill. Sorry to be crass about it. But slopping an orange slice, coffee cup, and spoon in a one hour exercise does not make a quality piece of art that should command good earnings. There's so many great artists out there, yourself included, studying, learning, growing, practicing, applying skill, design, intention, creavitity, to make meaningful and wonderful works. These slapstick pieces done in two hours have gotten lots of momentum and there's some occassional stellar pieces. But if you look at artist like John Pototchnik or Clyde Aspevig or even Kathleen Dunphy, plein air is a STUDY not a finished piece. They lead to insight, learning, appreciation for color, atmosphere, lighting. But coupled withe the skills and experiences of the artist in the studio, there's some really good works that get created. Kathleen Dunphy does some good plein air. but they are nothign in comparison to her studio works. Same with Pototschnik. and Jim McVicker...they are producing some exceptional landscapes IMHO...lots of skill and expertise that is more than a two hour quick draw in the field, or an orange slice, coffee cup, spoon. There's good works out there, brad. YOu know this. You really have your game on IMHO. I think the herd will thin, those with skill and perserverance will struggle through to the other side and make some great works. At least that's what I keep hoping. I'd hate for oil painting to go the way of sculpture, hand-crafted woodwork / plaster work or any of the other skilled 'trades' that got gobbled up by cheap manufacture and chinese cheap labor. Skill and quality painting will continue, I think..